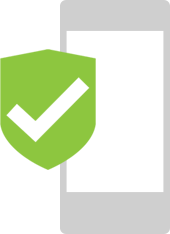 At Regions, we're always looking to bring you new and innovative ways to access your money. That's why we're pleased to offer you Apple Pay. 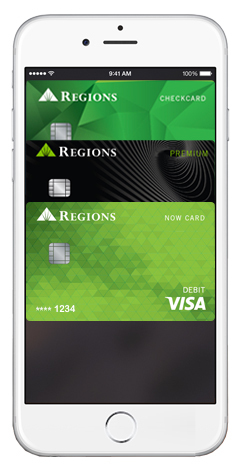 Store your Regions credit, debit or prepaid card digitally on your iPhone, iPad, Apple Watch or Mac Models. See a list of compatible Apple Pay devices. Make purchases at participating locations with just one touch of your device - no need to swipe your card. Apple Pay combines Apple's built-in unique security features with acceptance and security of your Regions Visa credit card. Greater simplicity - It's easy to set up and use. Greater convenience - Pay on the go at participating merchants who accept Visa® — just look for the Apple Pay icon at checkout. Greater security - You'll get a unique account number for your device, so you don't have to store your card number. And as always, you're covered by our $0 liability guarantee for unauthorized purchases. Step:1Add your Regions card to Apple Pay using your Passbook app. Step:2At the point of purchase, place your iPhone or Apple Watch near the merchant's card reader to authorize your payment. Authorize your purchase with your finger on Touch ID™. Step:3You may also pay with your fingerprint in a merchant app with the appropriate Apple device. We're here to help. Learn more by reading our Apple Pay FAQs.